(1) BY WAY OF MELBOURNE. Playbill says King Kong will open on Broadway next year. (Just keep those biplanes grounded!) “King Kong Sets Broadway Opening Night; Tickets Now on Sale”. This musical premiered in Melbourne in 2013 and was originally supposed to come to Broadway when Spiderman folded in 2014. But it didn’t. The anticipated stage musical adaptation of King Kong—written by Jack Thorne with a score by Marius de Vries and songs by Eddie Perfect—will officially open November 8, 2018, at the Broadway Theatre. Previews are set to begin October 5. The production, which features a one-ton, six-meter-tall silverback gorilla puppet as its star, arrives on Broadway following a 2013 Melbourne world premiere. An all-new creative team has been assembled to bring King Kong to Broadway, including Olivier Award-winning book writer Thorne (Harry Potter and the Cursed Child, Let the Right One In), Olivier Award-winning director-choreographer Drew McOnie (Strictly Ballroom, In the Heights), and Australian songwriter Perfect, who is also adapting Beetlejuice for Broadway. Perfect joins the show’s original composer and arranger de Vries (Moulin Rouge, Romeo + Juliet). (2) TWO FINS UP. Craig Miller comments on a screening of The Shape of Water. The film was pretty great. It’s set in the early 1960s but it has a sort of timeless quality about it. Set at some sort of secret, military-run laboratory, it’s about a lonely, mute cleaning woman (Hawkins) who works there and what happens when a new “asset” is brought in for investigation and experimentation. Her performance, and that of Doug Jones, are remarkable. More so in that neither character is capable of speaking but you understand them both perfectly. (3) MINORITY REPORT. The National Review’s Armond White says “Justice League Is the Epic We Deserve” – and means it in a good sense. Zack Snyder’s audacity in creating a comic-book movie renaissance (which began with the complex, ambitious Watchmen) has inspired philistine resentment from reviewers and fanboys who don’t want cinema. They’ve been desensitized to the form’s vitality and richness. (Like civics, art is no longer being taught in schools.) The schoolyard game of lambasting Snyder’s magnificent Man of Steel and the even more intricate Batman v Superman: Dawn of Justice almost directly parallels the unsubtle breakdown of our political process. And this year’s post-election delusional praise for the utterly mediocre Wonder Woman is a symptom of our current political paralysis. By coordinating DC Comics’ superhero characters into the fight against Steppenwolf, Snyder attempts to extend his saga from Dawn of Justice. Studio interference (Warner Bros. envy of the lucrative Marvel franchise) and personal tragedy have prevented Snyder from completing his vision on a scale commensurate with the ever-astonishing Watchmen. But as Aquaman (Jason Momoa), The Flash (Ezra Miller), Cyborg (Ray Fisher), and Wonder Woman (Gal Gadot) join Batman (Ben Affleck) in the most-intense-yet fight for human life, what remains of Snyder’s handiwork — after the studio imposed The Avengers dullard Joss Whedon on the final product — is still a triumph. (4) COCO. The Washington Post’s Michael Cavna talks to the stars and producers of COCO and looks at how Pixar is coming out with a Mexican-themed film for the first time: “‘Coco’ forced Pixar to dive deep into a real-world culture — and add some diversity”. PIXAR STUDIOS, for all its renown for creating highly detailed worlds, has rarely had to worry too much about cultural authenticity. Even after all their fabled research for movies such as “Brave” and “Ratatouille,” the filmmakers have been free to use their imaginations, without real fear of offending toymakers, automakers or entomologists. The Bay Area studio knew, however, that centering “Coco,” which opens Nov. 22, on Mexico’s Day of the Dead holiday would enter an entirely different realm, because it would include not only depictions of traditions, but also a significant increase in casting diversity. (5) THE SCIENTISTS IN SF. Tor.com nominates “Our Favorite Fictionalized Scientists, Mathematicians, and Inventors in SFF”. (6) GRAPHIC NOVEL ROUNDUP. In another piece, Michael Cavna gives his picks for “The 10 best graphic novels of 2017”. This debut graphic novel from a 55-year-old Chicago artist is a revelation: a deeply textured tale of dark histories framed as a girl’s diary and told through riveting art that is an homage to midcentury horror comics and film. A dark-horse winner that came out of nowhere. (7) NIGEL’S NEXT. 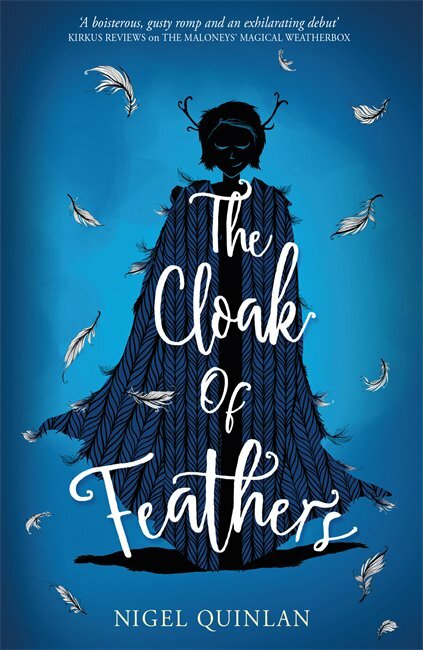 Nigel Quinlan did a cover reveal of his new book, The Cloak of Feathers, an MG fantasy coming in the UK and Ireland from Hachette Children’s in January 2018. It’s about an awful summer festival held every year in a small village in Ireland. Once every hundred years the Fair Folk visit, and it becomes a Great Festival, full of magic and wonder. Except everything has gone horribly wrong. The lake is polluted, there’s a ghost estate built on the shore, and their beloved Princess has vanished. Our heroes, the reluctant members of the Junior Knockmealldown Festival Committee (Cow-Fetching Sub-Group) must perform four Feats to win the Cloak of Feathers and rescue the Princess before the whole village is punished. (8) SUPER SJW CREDENTIALS. Quirk Books makes its selection of the “10 Best Cats in Comics”. Supergirl and Power Girl are not the only big name superheroes to have pet cats. Captain Marvel has her own feline companion, Chewie. Initially, Carol believed that Chewie was just a normal cat that could keep her company on her adventures, but when she met Rocket Raccoon, he claimed that Chewie was, in fact, a Flerken. Captain Marvel refused to believe that her furry friend was secretly a tentacle-mouthed, egg-laying alien with pocket dimensions in her body…but when Chewie laid 117 eggs on board the ship, she was forced to admit it was true. Although the 117 Flerken kittens were left at a rescue, Chewie herself teleported back on board the ship, and Carol decided to keep her, Flerken or not. (9) REBOUND. The Traveler pilloried the November 1962 issue of F&SF in a post at Galactic Journey. What a difference a month (and 55 years) makes! — “[November 19, 1962] Reverse Course (December 1962 Fantasy and Science Fiction)”. I’ve complained bitterly in this column on the meanderings of my favorite science fiction magazines. Galaxy has gotten too tame. Analog has gotten too staid. F&SF has gotten too literary. In fact, just last month, I was lamenting the streak of purple fluffiness that had corrupted that last mag. Story after story of unreadable droll nothings, or at best, fantastic horrors without any hard sf. The December 1962 issue did not promise to be any better. It has the same line-up of authors, the same subject matter of stories. There are even 11000…er.. 24 pages devoted to the concept of binary numbers. Has F&SF lost its mind?! (10) ANDY WEIR. The Arthur C. Clarke Center for the Human Imagination has an extra installment of its Into the Imagination podcast: “Bonus: Andy Weir (author of The Martian and Artemis)”. We have a mid-month bonus episode with Andy Weir, author of the novel The Martian, so memorably adapted in the film starring Matt Damon, and the new book Artemis, which launches today! We talk about lunar colonization, his approach to world- and character-building, and what he would do if he was in charge of the future of space exploration. Andy will be speaking at the Clarke Center on December 7th. (11) BEST AND THE REST OF AUGUST. Rich Horton reviews short fiction at Locus Online, covering Lightspeed 8/17, 9/17, Tor.com 8/17, Apex 7/17, Interzone 7-8/17, and McSweeney’s #49. There’s a good set of stories in the August Lightspeed. Ashok Banker‘s “Tongue” is an uncomfortable and rather over-the-top satire on the horrors of a traditional Indian mar­riage, set on an asteroid. The over-the-top elements are part and parcel of satire, though I also thought the portrayal of Indian culture seemed a wincing cliché, as did the corporate menace target; still, it shocks and scares. (12) ANALOG (NOT THE MAGAZINE). An op-ed writer for the New York Times claims “Our Love Affair With Digital Is Over”. (13) VERDICT ON NEW TURTLEDOVE. The Hugo Award Book Club contends “The Hot War is Turtledove at his best”. Of particular interest in this alternate history is the tragic — and believable — story of Harry Truman. Turtledove’s research into historical figures is always impeccable, and many of Truman’s decisions in these novels are based on courses of action that he considered in real life. Turtledove paints a portrait of an alternate failed presidency that hinges on one bad decision after another. The consequences of Truman’s mistakes keep compounding. The way in which this weighs on him in the novels is effectively conveyed, and this may be one of the best character arcs Turtledove has ever written. Turtledove seems to be arguing that even a well-intentioned president might invite calamity through brinksmanship. This cast may be one of the most memorable groups that Turtledove has written since Worldwar: In The Balance back in the 1990s. However, it’s still clear that Turtledove has difficulty writing characters from outside his cultural background — none of the important Korean or Chinese characters are given point-of-view sections. (14) BE OUR GUEST. 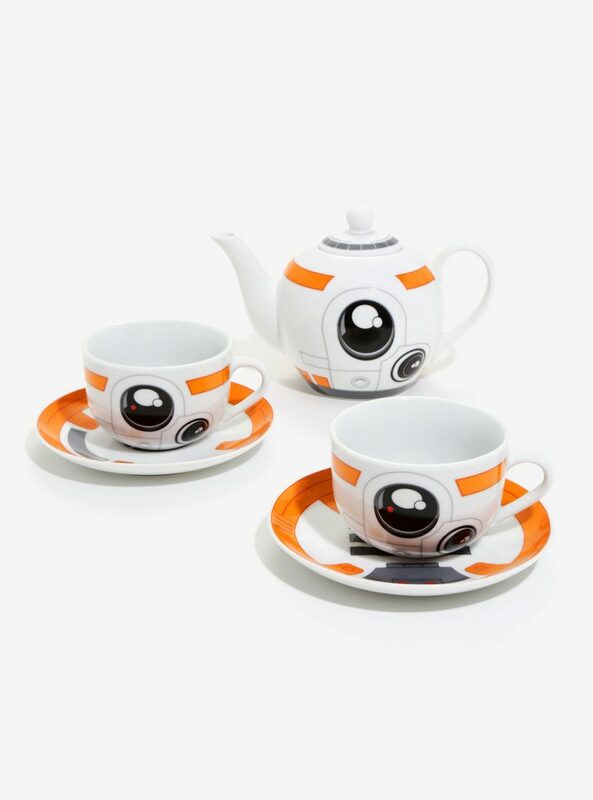 Her Universe is ready to fill your need to own the “Star Wars BB-8 Tea Set”. Being stranded on Jakku might be a downer, but it’s no excuse to avoid quality tea time. This BB-8 themed teapot and cup set from Star Wars is happy to roll up with a hot beverage. Set includes a 650 ml teapot & lid with two 220 ml cups and two 5 1/2″ saucers. (15) MILLENNIUM PLUS FORTY. Entertainment Weekly was there: “Luke comes home: Mark Hamill’s heartbreaking return to the Millennium Falcon in The Last Jedi”. Luke Skywalker quietly walks aboard the Millennium Falcon, alone. His old friends are gone. His old life is gone. He is ghostlike himself. The old Luke Skywalker is gone, too. That’s a scene from the latest trailer for The Last Jedi (see it here), but in real life, visiting the set of the old Corellian freighter was a similarly haunting experience for Mark Hamill. (16) BLABBING ABOUT CAMEOS. The Hollywood Reporter learned “Princes Harry and William Play Stormtroopers in New ‘Star Wars’ Film”. The royals — along with Tom Hardy and singer Gary Barlow — were rumored to make an appearance in Stormtrooper outfits in the film releasing Dec. 15. In August, Star Wars: The Last Jedi star John Boyega spilled the beans that not only did Prince William and Prince Harry film scenes when they visited Pinewood Studios in April 2016, but Tom Hardy also was milling around the set at the same time. By then, Take That singer Gary Barlow had already revealed that he had shot a scene in March. (17) KEEPING A FINGER IN THE PIE. According to SyFy Wire, “Steven Moffat and Russell T Davies to write new Doctor Who adaptations”. Steven Moffat may be leaving his gig as Doctor Who showrunner following this year’s upcoming Christmas special titled “Twice Upon a Time” to make way for Chris Chibnall (Broadchurch), but it looks like he isn’t done with the Whoniverse-at-large just yet. (18) SOME TIME LATER. I will never be the same now that I have seen this tweet. Here’s the link to his post. (19) MIGHTY MUMBLING. How It Should Have Ended does a comedy overdub of Batman v Superman and Dawn of Justice. It’s a toss-up whether these animated mouths remind me more of Clutch Cargo or Wallace and Gromit. This entry was posted in Pixel Scroll and tagged Adam-Troy Castro, Andy Weir, Arthur C. Clarke Center for Human Imagination, Batman, BB-8, Big Bang Theory, Craig Miller, Doctor Who, Galactic Journey, Guillermo del Toro, Harry Turtledove, Hugo Award Book Club, Justice League, King Kong, Nigel Quinlan, Rich Horton, Russell T Davies, Star Wars, Steven Moffat, Superman, Tor.com by Mike Glyer. Bookmark the permalink. 18)–Sorry, I don’t see it. I think his metaphor needs some work if he’s trying to connect the Penny character to Martha. I don’t know about the British, but Americans aren’t even waiting till after Halloween any more! Christmas ads (and decorations) are starting to appear in late October! Rob Thornton: Does Cat from Red Dwarf count? He’s one of my faves. I never knew that felines would evolve to be James Brown, but the show persuaded me! James Brown was one cool cat. QED. (3) The author of this piece is staggeringly inconsistent in his argumentation. He praises Justice League, saying that the DC movie offers a “ struggle, which gives it all moral weight: The fate of the world is at stake. ” … as if the fate of the world wasn’t at stake in various Marvel movies! Quote: “The “Keep It Moving” sequence gives a taste of what Woman Woman could have been with a real director.” Uh … did this guy even see Wonder Woman? This reminds me of what Alan Partridge once said about Wings. No one can defend Christmas decorations before Halloween, not even the Canadians, who have Thanksgiving earlier. However, few of us have the ability to control the behavior of stores or broadcasters. The rest of s can’t be held responsible for them. If we’re going for cats in comics, well, Miaowara Tomokato a.k.a. Samurai Cat did have a short comic book miniseries as well as the novels. @Nancy Sauer: Yay, thanks for the link! I can’t read the details, not having read Tenfox yet (blush! ), but I did look at the cover. It’s not bad, but I like the first two covers a lot more. Anyway, I’m going to hope for Tenfox for Xmas (or get it myself with Xmas money, post-Xmas), so I can read all about Elevenfox. It’s The Great Pixel, Charlie Scroll! Armond White is a notorious troll.